We returned tired but very inspired by our recent tour up North. My new car, well it’s second hand actually, has clocked up a fair few miles over the course of our journey which took us from Nottingham to South Shields, Belford, Glasgow, Moffatt, Peebles, Penrith and Carlisle before heading back to the Midlands. 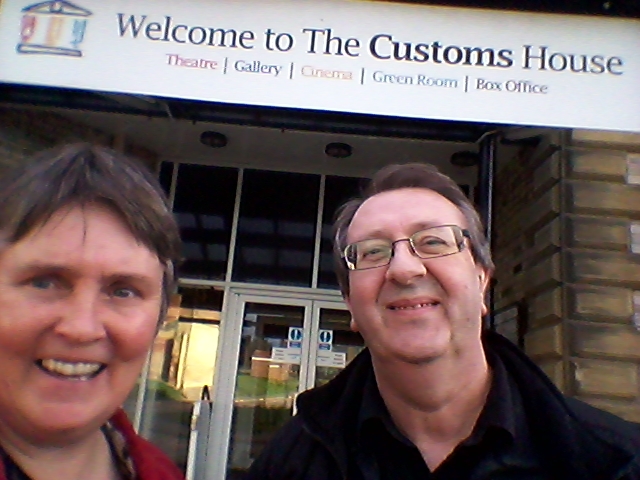 There was a lovely welcome at South Shields Folk Club at the Customs House Arts Centre with its stunning views of the River Tyne. You can almost reach out and touch the water – which is considerably cleaner than it was when I lived nearby as a child .. almost a hundred years ago .. ish ..!!! There was, predictably, some great singing from the massed voices of the club, joining in to make us feel very welcome, even on some of our self – penned songs. There was also a goodly amount of talk about various aspects of acoustic guitar making and playing styles from a number of enthusiastic members. A thoroughly enjoyable visit. On our day off, we took part in a session of traditional Northumbrian music at The Bluebell Hotel in Belford, Northumberland and enjoyed a warm welcome there too. It’s a great group of musicians there and the place was jammed to the rafters – well worth a visit if you’re in the area. It happens once a month at Belford but the musicians actually gather at a different pub in the area every Monday. 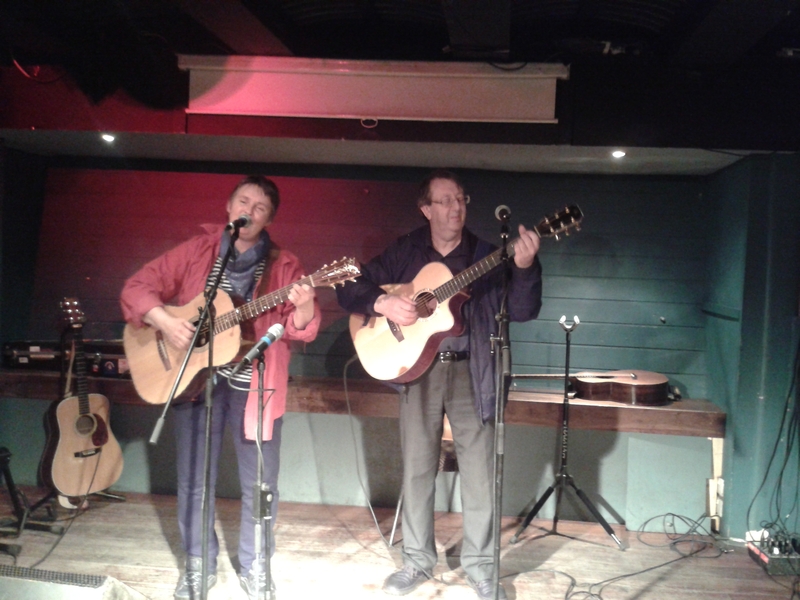 Our arrival at The Star Folk Club in Glasgow was memorable. This was our first visit to their new venue in the basement of The Admiral Bar, which is a GREAT venue. We were greeted with the sound engineer, Ian, telling us that the gig was still going ahead, all being well, but that a leaking pipe from the adjacent premises had flooded part of the basement and they were awaiting the emergency plumbers to sort it out. Thankfully, it was contained and didn’t affect the evening at all. Ian did a great job on sound and several of Steve’s old friends from the Glasgow area turned out to see us, so there was a lot of catching up to do in between sets. It was another really good night. On Wednesday we did a bit of shopping before travelling down to Moffatt for a house concert at John Weatherby’s ‘Sound Sense‘. We were thrilled to see a good turnout in the audience which included yet more of Steve’s old friends and a complete blast from the past for me – the appearance of an old work colleague from my days of teaching in Leicestershire around 1989. In addition it was great to see flautist Tom Grassi from Biggar and musicians Kathy Stewart and Ken Kennedy who had travelled from Peebles to see us. 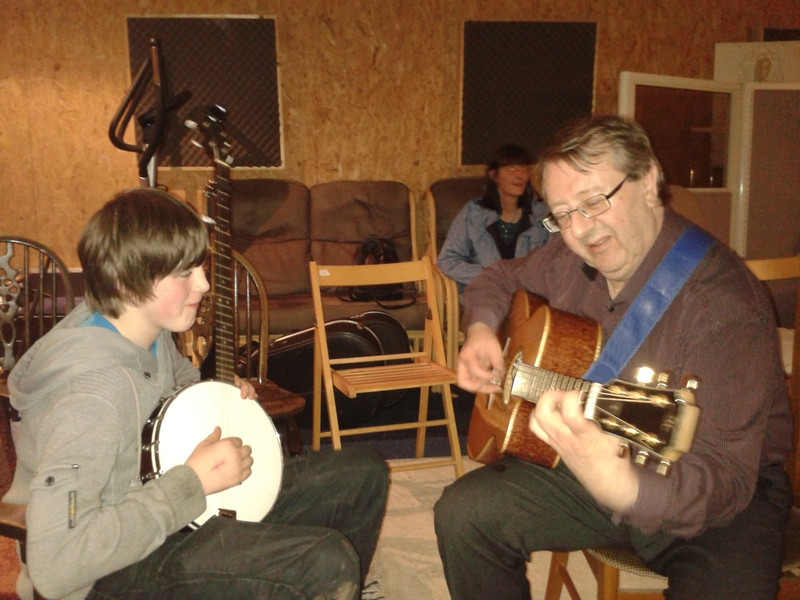 After much nattering at the end of the gig, Steve sat down with one of the young lads who had come to the gig and jammed on ‘Duelling Banjos’ with him. What fun! 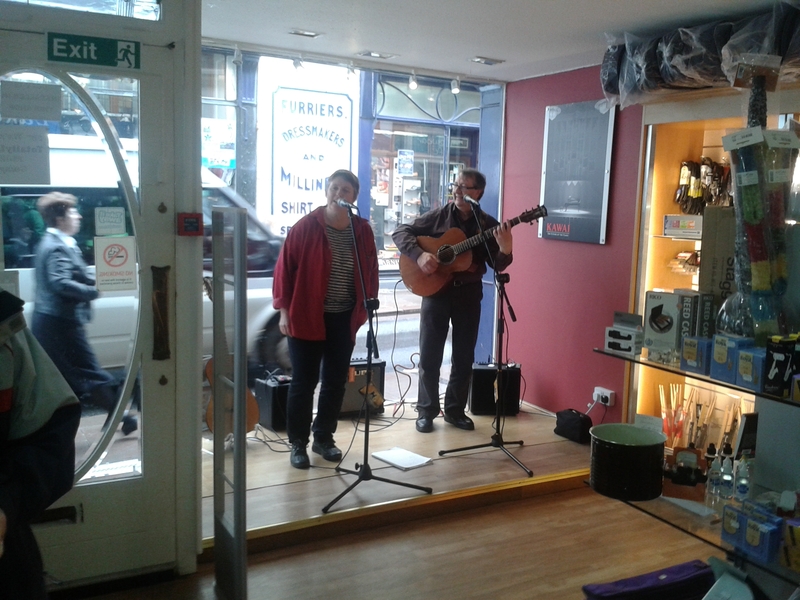 We didn’t have a gig on Thursday but went over to Peebles and joined in with an Americana session which Ken and Kathy run. That place was heaving too and a good time was had by all. On Friday afternoon Steve led a guitar playing workshop at the Lakeland Music shop in Penrith then we headed up to Carlisle where we partook of a Toby Inn carvery with the club’s organisers. That’s a great way to get to know the people who run things and it has become a tradition for booked artists performing at Carlisle Folk and Blues Club. The club works like a well – oiled machine, with everyone buzzing about setting up and preparing for the evening. There was a good turn out and we had loads of really nice comments, topped off by a great written review which appeared the next day. 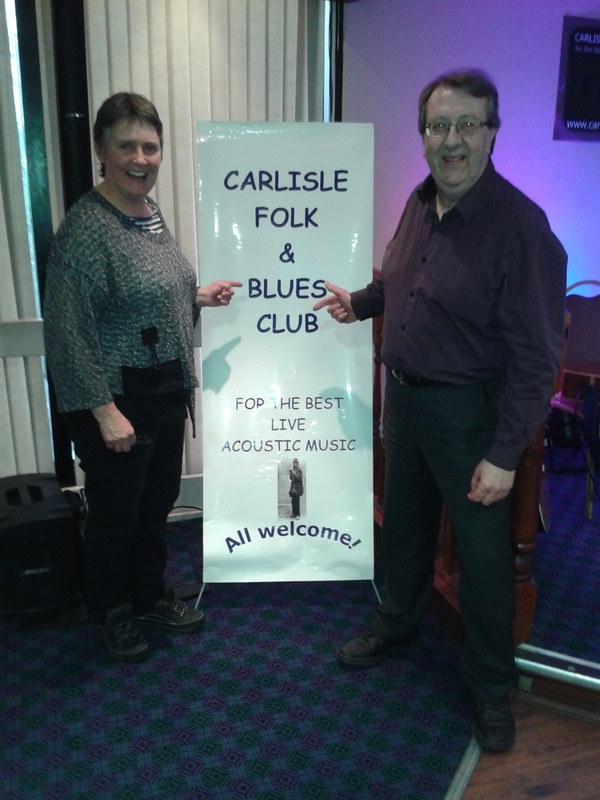 We loved our first visit to Carlisle Folk and Blues Club and will look forward to returning in the future. A brief visit back in Penrith to Lakeland Music on Saturday, gave us the opportunity to do a short performance to help promote a ‘Have a go at playing an instrument day’, and we again ran into some musical friends including young guitar player Andrew Caton and ‘Foolsgold’ from the North East. We had a brief rendezvous with some musician friends from Switzerland, Franz and Caroline Morrissey at Newcastle Central Station before Steve caught a train back home. A lovely way to finish our tour.